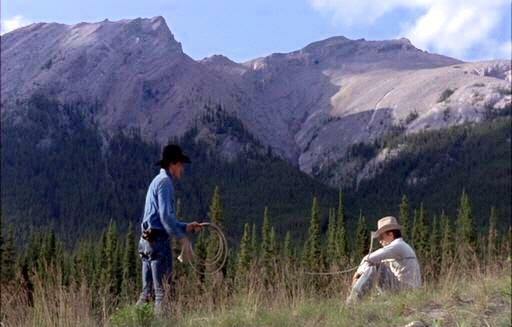 The “Get Goin’, Cowboy” Hillside (near Campsite #2) is at the northern end of Spray Valley Provincial Park, off Hwy 742, 7.3 km south of the Three Sisters Drive intersection in Canmore, and 2.1 km north of the Riding Ridge. 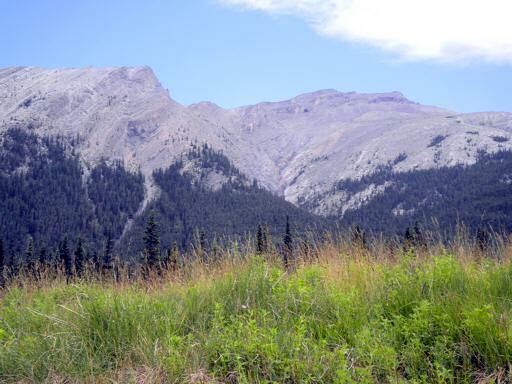 The easiest way to access the site is to follow Hwy 742 and park at the Goat Creek Picnic Area. Walk south along Hwy 742 for approximately 200 meters. At the point where the utility lines cross Hwy 742 you will see a gravel road to your right (west). Turn right and follow the gravel road approximately 0.7 km downhill until you reach a clearing. Turn right and continue across the clearing. You will come to the “Get Goin’, Cowboy” Hillside (Fight Hill), before you get to the nearby Dozy Embrace and Pole Bridge sites. If you encounter temporary fencing in this area, go around it to the right. For pictures taken during a hike to this location, see “Hike to Campsite #2” in Albums. One of the great sights of Campsite #2 is the “Get Goin’, Cowboy” Hillside (Fight Hill). Ennis tried to sort out his future here but, despite the inspiring surroundings, could not break free of powerful forces that restrained him. Feeling restrained? Try the same spot. Perhaps your luck will be better.